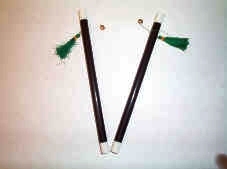 Two Chinese sticks or magic wands are held together one with tassel and one with string and tassel extended. Pull down the tassel and the string with the tassel goes up, pull the tassel again and the string with the tassel goes up again. In order to convince the audience that the two strings are not connected separate the sticks and pull the tassel down and the string with tassel still goes up systematically.